Nestled on the east shore of Lake Metonga in secluded Peterson Bay, the Mueller’s Peterson Bay Chalet is one of the most beautiful and unique places to stay in Forest County. Towering 200-year old white pines protect this hand-built Northwoods gem. 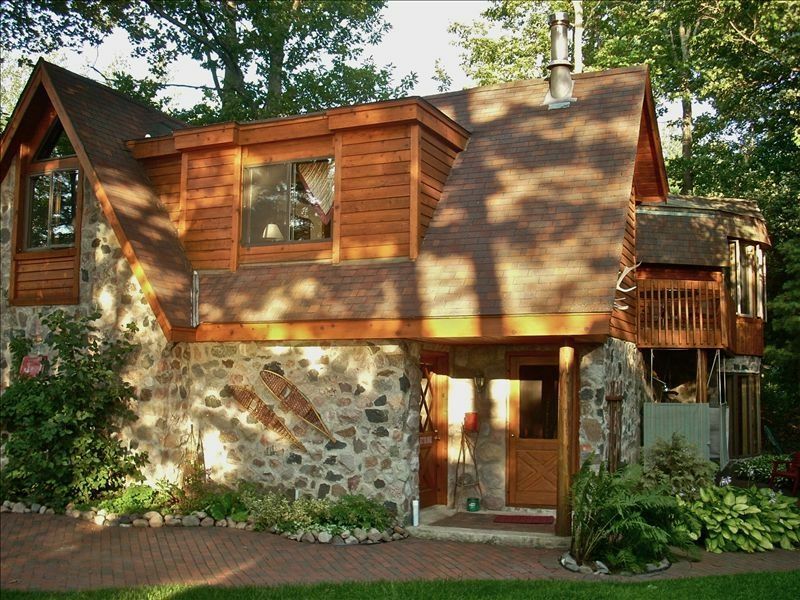 Built in 1998, this charming post and beam chalet features two bedrooms, one full bath, full kitchen, large, well-appointed living room with fireplace (for romantic fires in the fall and winter), an outdoor eating deck and refreshing outdoor shower. Bearskin rugs, rare animal mounts, hand-crafted birch twig railings and rare antiques give the Peterson Bay Chalet the warmth and feel of a grand Northwood lodge. Owners, Gary and Chris Mueller live next door and are wonderful hosts. 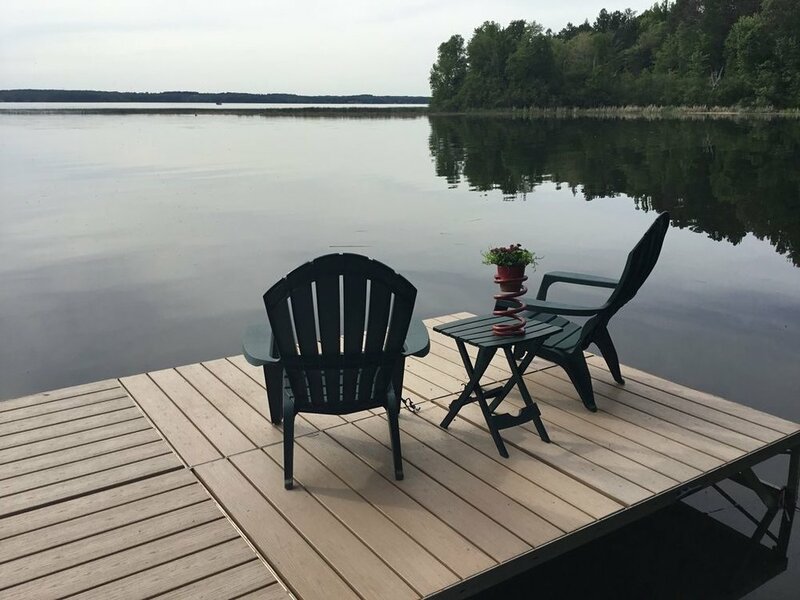 The Muellers are always happy to help make your northwoods stay relaxing and memorable. Originally from Milwaukee, the Muellers have been enjoying the "up north" life on Lake Metonga for over 35 years. In the summer, ask Gary and Chris to take you on an evening cruise around the lake on their pontoon boat. Don't forget your camera to capture the amazing sunsets, or to get an up close photo of one of our local residents- a bald eagle, loon or otter. In winter, the Muellers will be happy to take you for a personalized cross-country ski tour on their over 20k of privately groomed single-track trails. Peterson Bay is on the east shore of Lake Metonga about 1.5 miles from Crandon. Crandon is approximately 210 miles north of Milwaukee on Highway 8. Rhinelander is the closest airport, a half an hour away. In the spring and summer, feel free to bring a boat, canoe or windsurfer. And be sure to bring your fishing poles, because Lake Metonga is well known for it’s bass, walleye, northern and perch fishing. The crystal clear waters are also perfect for swimming, with two beautiful sand swimming areas on each end of the lake. In the evening, relax around a crackling bonfire, throw some horseshoes and enjoy the unforgettable Lake Metonga sunsets. In autumn, Forest County is ablaze with color. Whether you’re taking a scenic drive, hiking one of the thousands of miles of wooded trails or going for a fall boat tour, nothing beats the Nicolet National Forest during the peak of fall colors. 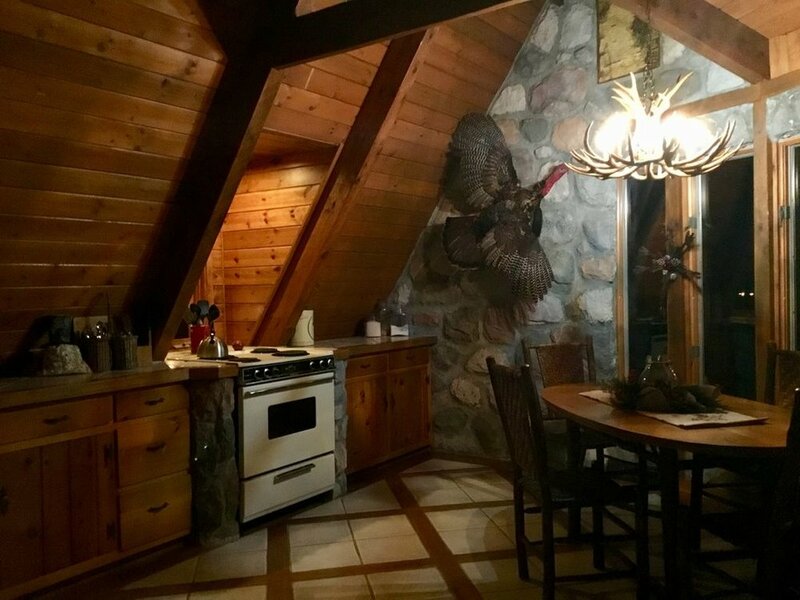 In winter, snowmobilers, hunters, ice fisherman and downhill skiers will also find the Chalet on Peterson Bay to be the perfect “home base” for a week or a long weekend of adventure. With hundreds of miles of groomed snowmobile and cross country trails criss-crossing the county, winter fun is never far away.